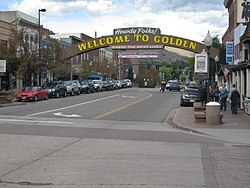 Golden, Colorado is a city in the US state of Colorado. It is the county seat of Jefferson County, Colorado. It was founded on June 16, 1859 during the Pike's Peak Gold Rush. Golden City was the capital of the Territory of Jefferson from 1860 to 1861, and the capital of Colorado Territory from 1862 to 1867. In 1867, the capital was moved to Denver City. In 2005, there were 17,366 people living in Golden. ↑ 1.0 1.1 "Active Colorado Municipalities". State of Colorado, Department of Local Affairs. Archived from the original on November 23, 2010. Retrieved December 6, 2007. ↑ Western Mountaineer, December 7, 1859 and Colorado Transcript, May 30, 1894 and June 15, 1905. ↑ Colorado Transcript, May 19, 1904. ↑ "Annual Estimates of the Population for All Incorporated Places in Colorado" (CSV). 2005 Population Estimates. U.S. Census Bureau, Population Division. June 21, 2006. Retrieved November 16, 2006. This page was last changed on 23 September 2018, at 22:28.